This group would create a much more radically liberal (for the time) constitution in this convention. This document would be nearly completely based on ideas that they had developed from enlightenment thinkers of the era. 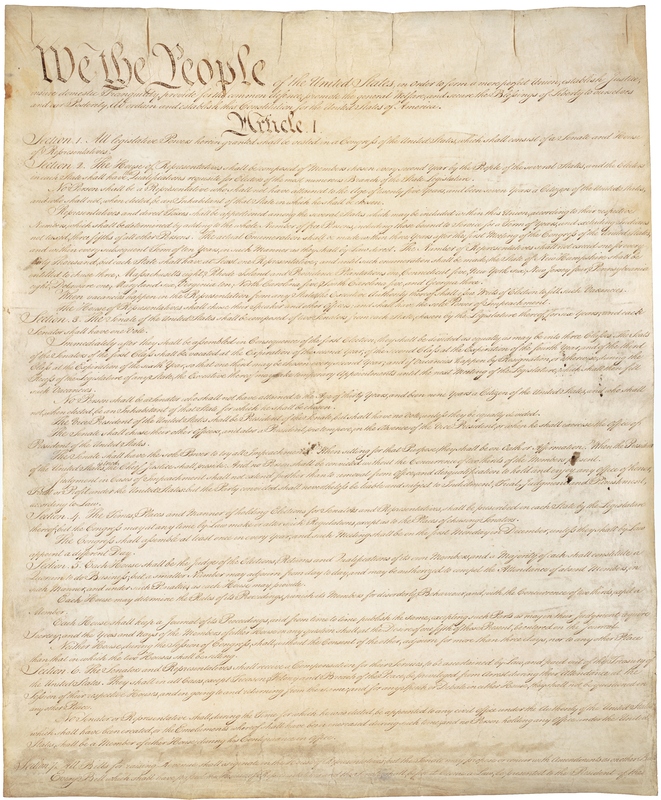 Some people unfairly view the creation of this constitution as only mildly interesting because of the near complete reliance on enlightenment thought in making it, but this belief forgets that the ideas they used for this document highly theoretical and never seriously considered to be used any time soon. The mere process of using these theoretical beliefs in the creation of a constitution was one of the more bold steps of the era, and one that literally changed the world from then on. The delegates would use the concept of republicanism as inspiration for much of their decisions as they progressed through this process. The belief behind the concept of republicanism was that each person would consider their own personal civic duty more important than their own personal desires, believing that, if achieved, this country would run smoothly. While that is a broad philosophical theme that is found throughout the document there are other specific concepts that were taken nearly completely from the enlightenment thinking of the era. One of the most clear examples of this comes from the use of the concept of separation of powers, which was an idea clearly developed by Baron de Montesquieu. In keeping with the thoughts of Montesquieu, the founding fathers split the power of the federal government into 3 parts to make sure that no one person could take too much power. Each of these groups had certain abilities to trump the decisions of the other in a concept known as checks and balances. While this was one of the most clear examples of the level of borrowing done in creating this new constitution, it was by no means the only example. of an official religion because they didn’t want this to become a form of tyranny on other religions. To combat this they simply refused to implement an official religion and allowed all people the rights to have their own. Many people still argue over what exactly was meant by this part of the text. Some claim that they were all Christians and therefore meant this to be a Christian country despite the clear decision on religious tolerance, while others claim that despite being Christian they didn’t want any religion to be able to dictate to others (including different versions of Christianity). Still another group chose to view them not as Christians but as deists in an attempt to counter the argument of Christianity. While there are quotes from founding fathers that could provide evidence for each one of these concepts, it is believed by most historians (based on later writings of founding fathers) that the majority of founding fathers wanted to have a clear separation between government and religion, regardless of the religion. This should not be viewed as an attack on religion, but a sincere fear of how oppressive government could be if religious beliefs were forced on others. We often speak glowingly in this country of the idea of “American democracy”, but it is interesting to note the sheer number of founding fathers that were afraid of too much democracy. It is clear that many of these men were worried about giving too much power to the uneducated people in the country. They wanted to find a way to make sure the “best” men ran the country, instead of this becoming a popularity contest. For this reason, they created a government that is more clearly considered a democratic republic. This technical term is not often used but it does show an important concept that we tend to forget. The United States does not have a democracy, but a republic that uses certain aspects of democracy. These men would create popular voting for state representatives and the president, but would find a way to keep the uneducated masses from taking over by creating the Electoral College. The electoral college was a group of people who were tasked with officially deciding the presidency for their state. These people could, and usually do, vote the way the people voted, but they do have the right to vote whichever way they choose. This concept would lead to some VERY controversial elections at times, when the people voted for one person but the position would officially go to another. Far and away the most controversial argument of the time would become known as the “great compromise” in later years. The delegates were very worried about how to create the legislative branch. Two ideological sides would develop based in large part on the size of the state the delegate came from. Those with large, populous states would prefer the Virginia Plan, in which representation in the legislature was based on population. This would end up giving more power to the states with more population, since they would be able to send more representatives. The other plan, which would be popular among small states, would be the New Jersey Plan, where representation would be equal among the states regardless of the population differences. The delegates would eventually compromise by doing both plans at the same time. The senate was created as an upper house, where each state was given 2 representatives regardless of size. The House of Representatives was created as a lower house, where representation was based completely on the population size within the state. The argument over whether to count slaves for representation numbers among the states would be another difficult argument during these debates. At no point did they consider giving African Americans the right given to other groups, but those states with large slave populations did want them to count towards their representation numbers. The thinking was that if the slaves were counted as people it would increase their representation in the House and give them more power in government. Southern states, for this reason, would become much more interested in counting the slaves as a person, while northern states didn’t want them counted at all (so that they could have more power and possibly end the process eventually). The groups would eventually decide to count slaves as 3/5ths of a person for representation purposes, which was a win for the south since it was more than half. They would also agree to end the importation of slaves from Africa within 20 years (by 1808), but would not end the institution of slavery itself. Many people see this as an indication that most of the founding fathers officially accepted slavery, especially since all 3 branches of the government were run by slave holders until 1850. In the end, this document would be among the most important documents in the history of the world. It would officially establish the first stable democratic government and would inspire countless other changes in the coming years. Numerous other countries would use our constitution as a draft to build on from then on.